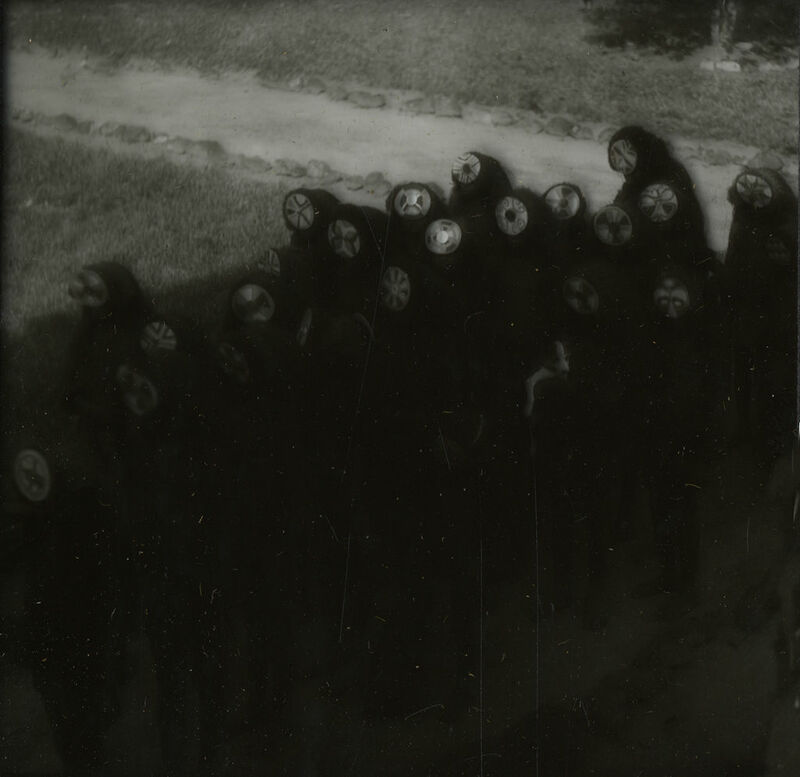 A gathering of SCP-414-1, taken in 1935. Special Containment Procedures: SCP-414 is currently uncontained; containment efforts focus upon mitigating media attention and providing social work programs to demographics targeted by SCP-414. Individuals affected by SCP-414 iterations must be dosed with Class-B amnestics upon recovery and are to be kept under observation. Individuals reaching the final stage of SCP-414-2 are to be contacted by a Foundation social work front company; individuals under final stage SCP-414-2 are to be treated with tri-weekly talk therapy and trained animal companions where applicable. As it is beyond the Foundation's resources to perform surveillance on every possible target of SCP-414, records from social work organizations and mental health care centers are to be trawled for SCP-414 phenomena where possible. Any media reporting of SCP-414 phenomena are to be removed and a cover story provided; a list of applicable cover stories can be found in Document 414-B. Description: SCP-414 is a phenomenon that targets asocial humans and is categorized into two derivative effects, SCP-414-1 and SCP-414-2. The asociality may range from minor introversion to complete isolation. SCP-414 primarily affects individuals under the NEET1 demographic with no regional preferences. SCP-414 begins when a humanoid in a circular mask, referred to as SCP-414-1, appears in front of a targeted human. SCP-414-1 typically claims to be an employee for a local social work organization. SCP-414-1 are uniformly tall humanoids wearing circular masks and clothing that covers the whole body. SCP-414-1 only appear when attempting to contact a targeted individual and disappear after successful contact has occurred. SCP-414-1 is believed to have a single collective consciousness capable of sapience, cognizance, and intelligence. SCP-414-2 is a chronic, degenerative condition resulting from any successful interaction between a targeted subject and an instance of SCP-414-1. Successful interaction occurs when SCP-414-1 has a successful face-to-face conversation2 or contact with a targeted subject. A subject that has contracted SCP-414-2 undergoes 4 stages lasting between 2 and 276 days, with a 5th stage believed to be permanent. Individuals who are under 30 years of age, or who received SCP-414-2 through physical contact, progress through stages at an accelerated rate. Stage One: Subject feels increasingly lonely. Coping mechanisms not involving face-to-face interaction to distract from loneliness causes an increase of feeling. Subject experiences a loss of pleasure when participating in solitary activities. Stage One advances when the subject interacts with another human to alleviate loneliness. Stage Two: Subject experiences a total loss of pleasure when participating in activities not involving in-person interactions with others. Subject begins to have difficulty in recalling events in their life that contributed significantly to their sense of self but is cognizant of and can recall having such events. Stage Two advances when the subject interacts with other humans at least once every 7 days. Stage Three: Subject is incapable of feeling fulfillment unless interacting with other humans once every 5 days. They are unable to recall ever enjoying solitary activity or their life before the age of 13. Subjects remain cognizant of this inability. Their sense of self is reduced. Stage Three advances when the subject participates in social events at least once every 7 days. Stage Four: Subject is incapable of feeling fulfillment without interacting with other humans once every 45 hours. They are unable to recall having significant relationships lasting more than 2 years and are cognizant of this inability. Any sense of self is reduced to name, gender, age, and current emotional state. Subject usually becomes highly productive to feel fulfillment, participating in a range of social activities such as volunteering and hosting gatherings. The circumstances to advance Stage Four are currently unknown. Stage Five: This is currently considered the final stage. Subject develops hallucinations and sensations of being physically hollow or empty when not currently participating in social activities, causing them to become upset when not in proximity to another person for any length of time over fifteen minutes. They are unable to recall having significant relationships and are cognizant of this inability. At least ███ individuals have been confirmed to have reached Stage Five. For a list of confirmed SCP-414-2 cases and extensive description, please refer to Document 414-2-A. Notable cases of SCP-414-2 are 414-2-Macgyver-Jacob, the current oldest case, and 414-Kyong- Myung, with the shortest recorded interval between diagnosis and suicide of 48 hours. There is no cure or treatment available beyond coping mechanisms. SCP-414-2 has a fatality rate of 46.78% over 5 years and 67.84% over 10 years. Individuals over the age of 40 have significantly higher fatality rates of 87.23% over 5 years and 93.85% over 10 years. All fatalities are a result of suicide. 09/12/2014 Incident 414-A: At 06:02 Doctor Eliza Chuang, then-Principal SCP-414 Research Scientist, was contacted by three SCP-414-1. Dr. Chuang had a successful conversation, transcribed below. Dr. Chuang was succeeded by their primary assistant, Doctor Alice Ogawa, immediately after Incident 414-A. Despite constant social interaction and animal companionship, Dr. Chuang committed suicide on 09/03/2015, 965 days after advancing to Stage 5 SCP-414-2. [06:02] 3 SCP-414-1 humanoids appear at Dr. Chuang's office door. Dr. Chuang can be seen walking to their office. Dr. Chuang stops upon seeing the group of SCP-414-1. [6:03] The group of SCP-414-1 move towards Dr. Chuang at a speed of approximately 1 meter per second. One SCP-414-1 humanoid grasps Dr. Chuang by the wrist as they attempt to leave. Dr. Chuang begins to struggle and shout for assistance. [6:04] Security arrives. Dr. Chuang can be seen waving their free arm and shouting "Do not approach! Do not talk! Stand there, please!" Security draws weapons and aims at the group of SCP-414-1 but do not fire. Dr. Chuang turns back to the group of SCP-414-1. [6:06] Dr. Chuang, calmly: "If you wouldn't mind, could you answer a few questions? Why are you doing this? How do you benefit by doing this to people?" [6:08] SCP-414-1, in unison: "They work, so little, they are held up when they need to be the foundation, the young so much so. I will help every one of you." [6:10] Dr. Chuang: "Even when they kill themselves? Even when they forget who they are? How does that help- what is your reasoning?" [6:12] SCP-414-1, in unison: "It is a last usefulness to society, to die and leave resources for others, others make use of them. Forget yourself for your society. You cannot be egotistical when the ego is carved out. Selfishness, I will cure it, by excising the tumor. I cure society and make the lost find purpose. I help." [6:14] Dr. Chuang, agitatedly: "But society needs that! They need individuals! Selfishness can drive and motivate success!" [6:15] SCP-414-1, recoiling collectively: "You are sicker than I thought. You may be kind among your human populace, but I have surely known kinder men. I thought, you, who worked for the good of all, would be my ally. But it's alright. I will take care of you. You will feel better when I'm done with you." [6:16] Dr. Chuang: "Why did you come to me? Who are you? Where are you from and how do you work?" Dr. Chuang can be seen attempting to free themself from the grip on their arm. [6:15] SCP-414-1, in unison: "You want to stop us. But you are trying to stop helping. You are secure, contain, protect. I am society, community, progress- a shepherd for humans. You are a sick lost lamb, not for much longer." [6:17] Dr. Chuang attempts to speak, but an SCP-414-1 instance puts a gloved finger to their lips. The instance pets Dr. Chuang's head and presses its mask against the side of their head, accompanied by a kissing sound. [6:18] The group of SCP-414-1 produces a flash of light and the camera feed cuts for 0.3 seconds. When the feed is returned, all SCP-414-1 instances are missing. Dr. Chuang kneels on the floor, head in hands. Foreword: This interview occurs 35 days after Dr. Chuang is confirmed to have entered Stage 5 SCP-414-2. Dr. Ogawa: Good morning. Dr. Chuang. How are you feeling? Dr. Chuang: (excitedly) Good morning! Your face is so… ah, it matters little! You are here, it is good to see you! Dr. Ogawa: Could you explain what you were about to say regarding my face? Dr. Chuang: (calming down) Ah, just. It was so… I once knew… a face. I once cared for… someone. An assistant, I had an assistant. But I don't remember them. Dr. Ogawa: I see. How do you feel when you remember that you used to remember? Dr. Chuang: It is an unpleasant emotion, definitely. I remember that I used to know and feel so much. I once had a past, but it's gone now. I used to… have a project. But that's gone, now. It's all gone. But enough about me. What's important to you? Tell me more about yourself. Dr. Ogawa: My research is important to me. It was the life work of my mentor and now it's become mine. It's what connects me to them. Dr. Chuang: It's good, you have something to believe in. That's necessary- someone always has to believe in something, with all their being, that's how humanity makes progress. Individuals pursuing what they believe in. Where's your mentor now? Dr. Ogawa: (quietly) No longer with me, as I understand it. Dr. Chuang: How unfortunate… I'm so sorry. Can I help you? Maybe be your assistant? Or keep you company in the laboratories. As I understand, they can get very quiet and lonely. Dr. Ogawa: (begins to get up) Thank you for the offer but I think we're done now. Dr. Chuang: Wait! Please, wait just a moment. Could you at least tell me your name? Dr. Ogawa: (leaving, quietly) Alice. Just Alice. Dr. Chuang: I'm glad to have known you, Alice. I'm sure, this research is stressful for you. I'm sure you've made your mentor proud and, I think, that's what an assistant would want, is to succeed their mentor? Dr. Ogawa: (whispering) Not as much as I want them back… (louder) Thank you for your kind words. Good bye. Dr. Chuang: Goodbye! (smiling widely, waving) Keep your head high. It'll get better. Have faith. Closing Statement: Dr. Ogawa no longer performs routine interviews with Dr. Chuang. Routine interviews will be conducted by Dr. K███ M██.